Amma often made Jeera Charu or Saaru when a rasam was needed to round out a meal in a hurry. Whenever we had unexpected company at mealtimes (especially my grandfather who insisted on the rasam course for lunch), Amma would quickly signal us to get the masala ready for this rasam while she got everything else ready. 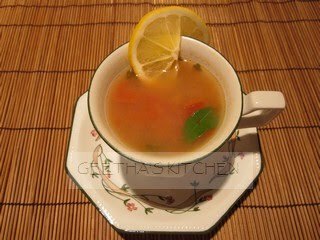 By the time the guest was seated for the meal, steaming hot rasam fragrant with cumin and pepper was ready to serve! It is very quick to make - in less time than it takes me to write about it! It is a delicious light soup perfect for a cold day or when one is under the weather. Paji loves his portion in a mug to sip regardless of the weather or health conditions with a couple of roasted papadams on the side :D.
Place the tomatoes in a 2 quart/liter pan with salt, turmeric and 2 cups of water. If you are using tamarind, add it now (if using lime/lemon, add the juice at the end). Cook until tomatoes are soft. In the meantime, make the masala: finely powder the cumin, black pepper and toor dal together; they can also be ground in a blender with a little water. Add the cumin-pepper masala to about 4 cups of water; stir the masala water into the tomatoes and cook until foamy but not boiling. Turn off the heat; add cilantro and the crushed chopped curry leaves on top. Prepare thalippu and pour carefully (hot oil coming into contact with hot liquid) over the curry leaves. Cover and let rest for 10 minutes. Add lime/lemon juice if using and chopped cilantro if desired. Serve piping hot in mugs or over soft plain rice. Enjoy! To your good health! !